Work-related hazards may have a huge impact on the physical as well as the psychological health of the worker, which in turn reduces the effectiveness of an organization. Hence, psychosocial hazards are being considered as a major factor to be addressed for the health of the individual and the organization. Workplace stress occurs if there is a mismatch between the ability of a worker and the demands on the individual. There is an urgent need for monitoring the stress in the workplace. Apart from identifying and dealing with the hazards, it is the duty of the employer to provide a healthy and hazard free environment for the workers. Possible risks in the working environment that could harm the workers can be assessed by a risk management approach. Risk management approach usually consists of the following steps: (a) an analysis of the situation and an assessment of risk; (b) the design of an action plan to reduce the risk of work stress; (c) the implementation of that action plan; (d) its evaluation; and (e) learning and further action from the results of that evaluation. To have a better working environment, the employees should be involved in decisions related to them, the organization to have a better communication both ways, workload should be optimal, and violence to be totally avoided. It should be remembered that all these hazards could be averted at the organizational level with better management and decision making. Finally, if both the employer and employee work together to minimize the levels of work-related stress, leading to improvement in work-related quality of life, which will not only ensure a physically and mentally healthy workforce but also could culminate into the better economic output for the organization. World Health Organization (WHO). Occupational Health- Protecting Workers' Health Series No. 3Work organization and stress. Available from: http://www.who.int/occupational_health/publications/pwh3rev.pdf?ua=1 [Last accessed on 2018 Aug 23]. Kinman, G, Court S. Psychosocial hazards in UK universities: Adopting a risk assessment approach. HighEduc Q 2010;64:41328. OSHWiki contributors. 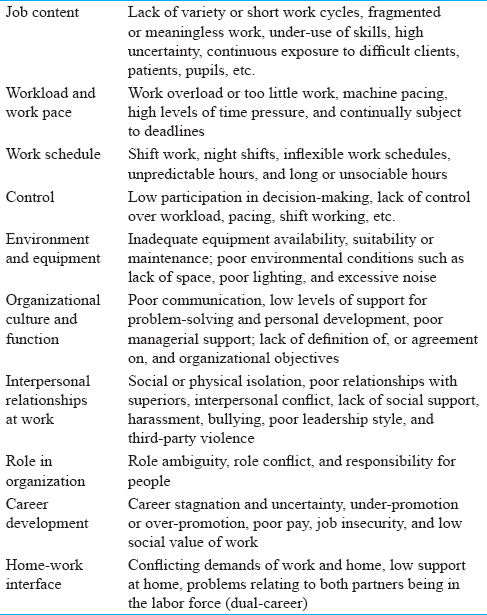 Psychosocial risks and work-related stress: Risk assessment. OSHWiki 2017. Available from: https://oshwiki.eu/index.php?title=Psychosocial_risks_and_workrelated_stress: _risk_assessment and oldid=247240. [Last accessed on 2018 Aug 25]. Middeldorp CM, Cath DC, Boomsma D. A twin-family study of the association between employment, burnout and anxious depression. J Affect Disord 2006;90:163-9. Marmot M, Bosma H, Hemingway H, Brunner E, Stansfeld S. Contribution of job control and other risk factors to social variations in coronary heart disease incidence. Lancet 1997;350:235-9. Schaufeli WB, Greenglass ER. Introduction to special issue on burnout and health. Psychol Health 2001;16:501-10. World Health Organization (WHO). Occupational Health- Protecting Workers' Health Series No. 6. Raising Awareness of Stress at Work in Developing Countries. Available from: http://www.who.int/occupational_health/publications/raisingawarenessofstress.pdf?ua=1 [Last accessed on 2018 Aug 23].